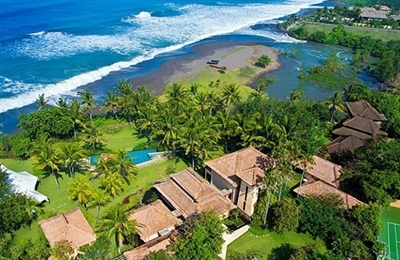 Staying at Bendega Nui is a wonderful way to experience Bali. The neighbouring paddy fields scattered with colourful flags and tinkling bells to scare the birds away from the ripening rice; the crowing cockerels; clear blue skies and amazing sunsets were a delight in themselves, but to enjoy all of this from the luxurious surroundings of this stunning new villa (completed end 2009) was a real privilege. The super-comfortable beds (I felt like Alice in Wonderland climbing up onto the deep mattress of the canopied four-poster in our bedroom! ), bold colourful fabrics, tasteful pieces of art, impressive sound system and blissful swimming pool were just some of the features that made a very clear statement about how much care and thought Bendega Nui's owners (who regularly stay there themselves) have put into the design and finish of their tropical holiday home. 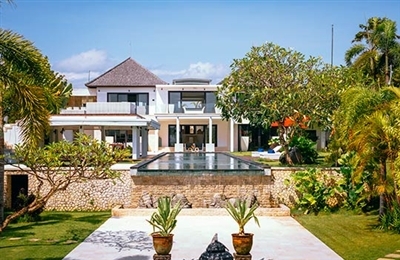 In recent years, the Canggu area has sprouted some exciting new venues for drinks and/or dinner – several of which you can walk to from the villa. That said, we felt no desire to eat out after sampling the chef's culinary creations: From roasted vegetable salads, to steak and chips, to chicken curry, cheesecakes and crème brulée – everything was beautifully presented, absolutely delicious, and served with a smile. Bendega Nui is a peaceful retreat; breezes from the nearby coast kept things cool wherever we chose to relax – and there was no shortage of options, from the hidden deck beyond the pool, to the shady reading pavilion next to one of the pretty ponds, to the bedroom balconies with their lovely views. And what better way to round off the day than with a glass of wine and a good movie on the big-screen plasma TV, or a social game of pool over a couple of beers – listening to whatever takes your fancy from the vast selection on the Sonos sound system (or bring your own – iPod docks in every bedroom). We felt that Bendega has something to please everyone in the family and would also make a great place for a group of friends to get together for a holiday, as well as (especially if you rent the one-bedroom suite and three-bedroom Bendega Rato next door) an exceptional and truly memorable wedding venue. Wow…from private pool to shallow sea in five paces? 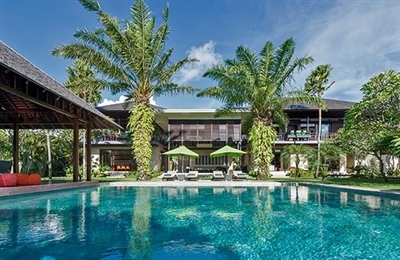 We’ve been lucky enough to stay in quite a few beachfront villas, but none have been as close as Villa Cemara! We were amazed when we first walked through its unassuming entrance and into the enormous living pavilion; the view was so attention-grabbing that we hardly noticed the cold towel and freshly squeezed orange juice that were pressed into our hands in welcome. When we eventually dragged our eyes away from the vista, Pande showed us around the place. We loved that the bedroom suites were all named after tropical flowers found in the garden. And the Australian owner’s taste was evident in the exquisite Indonesian furnishings, artefacts and art; gosh, is that really an original Arie Smit painting? Surely that can’t be a real Hoffker? And I felt an acquisitive flash for that fabulously gilded door framing a mythical garuda. The first question was where to relax. The pond bale? The living pavilion daybed? The poolside sun-lounger? The pool was just too inviting, and after a refreshing dip, we slipped through the gate onto the golden sand for a leisurely sunset walk, returning to find a tasty dinner waiting for us. (We found the staff to be very friendly and obliging, and appreciated that they knew when to disappear. Two of them share cooking duties, and there’s an extensive suggestion menu of Balinese, Indonesian and western dishes … plus one of the cooks is dab hand at Mexican cuisine.) This is a fantastic fair-share villa for couples or a group of friends; it’s very family-friendly too. Though the master pavilion is gorgeous, we don’t think anyone would be upset not to get it; in fact we chose to stay in the guest bedrooms instead, preferring their scale and light. The villa is great for those who want to relax and recharge their batteries, but the more energetic can go jogging or cycling along the promenade, or head to the water-sports centre for a spot of kite-surfing or sailing. We thoroughly enjoyed our it-can’t-possibly-be-a-once-in-a-lifetime Cemara experience, and were not at all surprised to learn from the villa manager that well over 90% of guests return. That’s now sure to include us too. First impressions are always important and we received quite a welcome at Villa Kemala, with canapés and passion fruit juice enjoyed on the beautiful hanging terrace. Once we had settled in we were served cappuccino, homemade cakes and excellent, buttery cookies – quite a treat after a long journey. Only completed a month before our stay (November 2012) we were lucky enough to be amongst the first guests to enjoy the pristine, sparkling newness of Villa Kemala. Rich in details, it’s clear that an enormous amount of time, energy and thought has gone into creating this elegant and luxurious haven. No corners have been cut, fittings are the sleekest, linens are the finest, artwork is stylish, iPod docks are in every room, and artefacts have been thoughtfully placed to avoid any sense of clutter. Gorgeous furnishings include sleek mosquito nets and throws in the upstairs bedrooms, and we were impressed by the small but carefully chosen selection of books and board games. 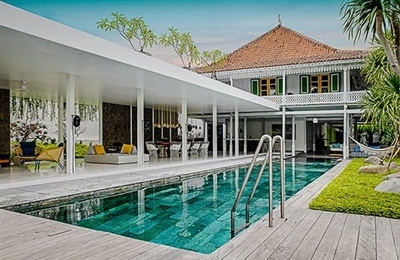 Villa Kemala seems to have all the bases covered, a peaceful and picturesque setting not far from the beach, stunning pool area and gardens, plus a spa balé for the girls and a pool room for the boys. The staff are fabulous, and took very good care of us without intruding on our space.